I am behind on blog posts so I will recap yesterday. 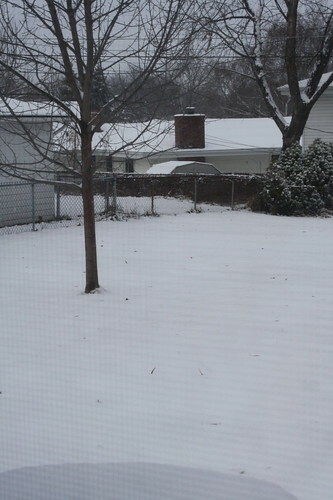 It snowed overnight, so I shoveled a bit before heading to Body Pump at the YMCA with Angie. 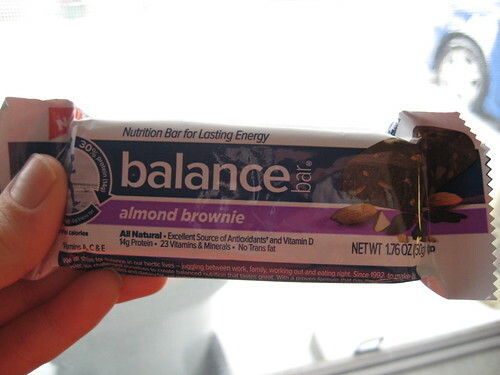 I had coffee, cheerios and half of a Balance Almond Brownie bar before class. Aaah, Friday, how I love thee. I will also love Wednesday of next week, since it will be a “Friday” before a four day weekend. We don’t have much on our agenda for the weekend, but I made a fairly big to do list today. I will try to accomplish almost everything! Breakfast today was Total cereal and coffee. 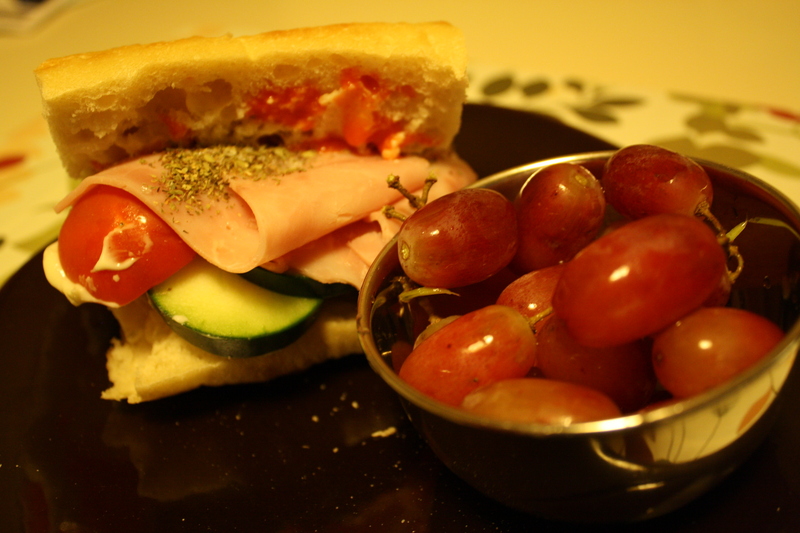 I ate a quick breakfast so I could spend more time making a healthy lunch for Craig and I.
I made us both ham and cheese sandwiches on Arnold’s Thins. 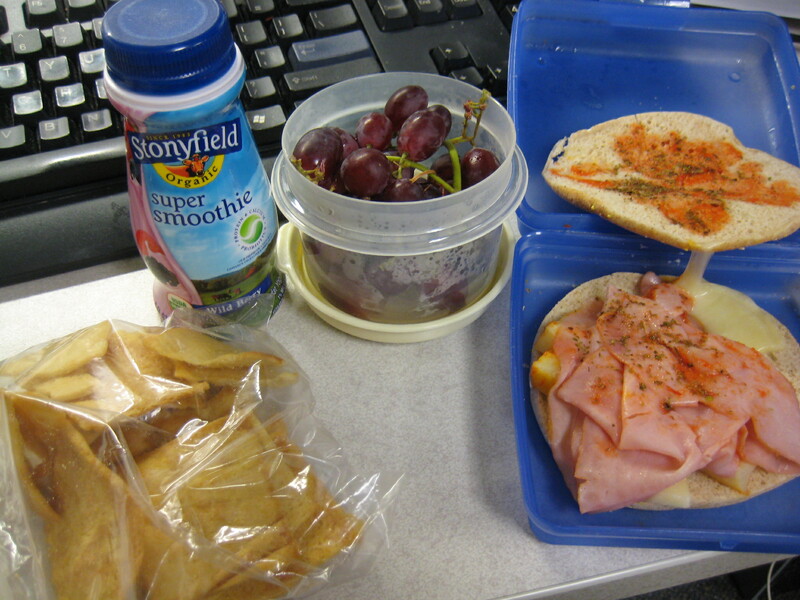 Additionally, he had a Yoplait yogurt and I had red grapes, a Stonyfield smoothie and pita chips. After work, I headed to the YMCA. I logged 32 minutes on the elliptical and lifted some free weights. The machines were so busy tonight that I figured I would rather wait until the weekend when it’s quiet and I don’t have to wait around to do my circuit. I had a craving for pizza for dinner so we had a frozen one. I made it a little healthier by adding broccoli and red peppers to my half (Craig is grossed out by broccoli, unfortunately). Wow, that was so good! 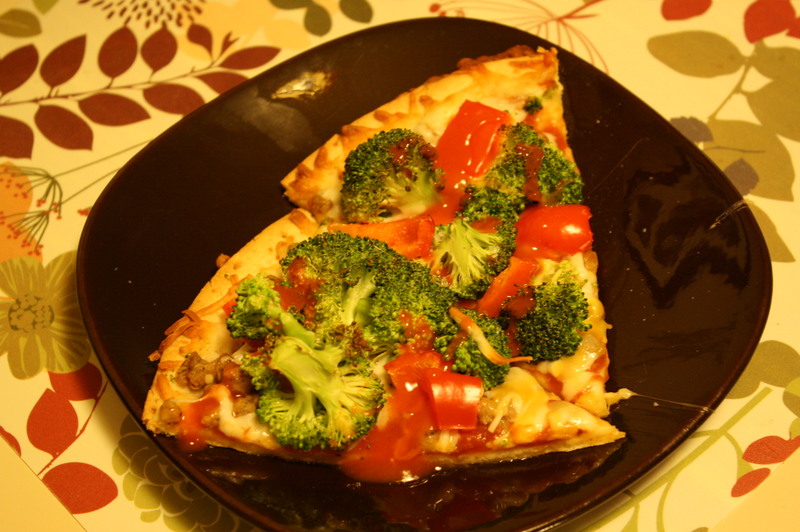 I am going to add both of those veggies every time I eat pizza now! Of course I had to have dessert. I have been ignoring my pumpkin ice cream all week, so I had a little bowl of that. Maybe I want to save my pumpkin cravings for Thanksgiving. Speaking of, my mom and dad are hosting turkey day and my mom is not clear about what she wants me to bring. She will make the pumpkin pie and sweet potato casserole. My mother-in-law will bring the green bean casserole, which is what I was going to bring. I planned on finding a healthy version of it to make. Now that is no longer an option. I want to bring something healthy–any ideas? I guess I will be searching food blogs this weekend to look for something. That or I can just bring wine! Honestly, holidays sort of frustrate me and it shouldn’t be that way. I don’t find them relaxing and I never even have to host any parties! I’ll stop venting and cross my fingers someone comments with some healthy recipes to share. Tomorrow morning, I want to get to the 8:45 yoga class, Starbucks to enjoy the buy one get one free holiday drinks and then Craig wants to buy a new toilet at Home Depot. We want one that is more green and uses less water. All I want from Home Depot is a spice rack to mount on our pantry door! Love the differences between male and female priorities in a household. My co-worker and I were discussing that this morning. I want to decorate and organize, Craig wants to make the house green and improve manly things. Driving to the grocery store tonight, I heard Coldplay’s Viva La Vida and this line was perfect for today: “it was a wicked and wild wind.” Whoa, today we are the windy city! What a crazy storm with high winds and rains. Breakfast was the rest of the pumpkin oatmeal that I couldn’t finish for breakfast yesterday. I added a big chunk of greek yogurt for some protein and sweetened up a little more than yesterday’s bowl with some maple syrup. Lunch was a whole wheat tortilla with pinto beans, shredded cheese and topped with Frank’s Red Hot sauce (I swear, I never get sick of this meal). 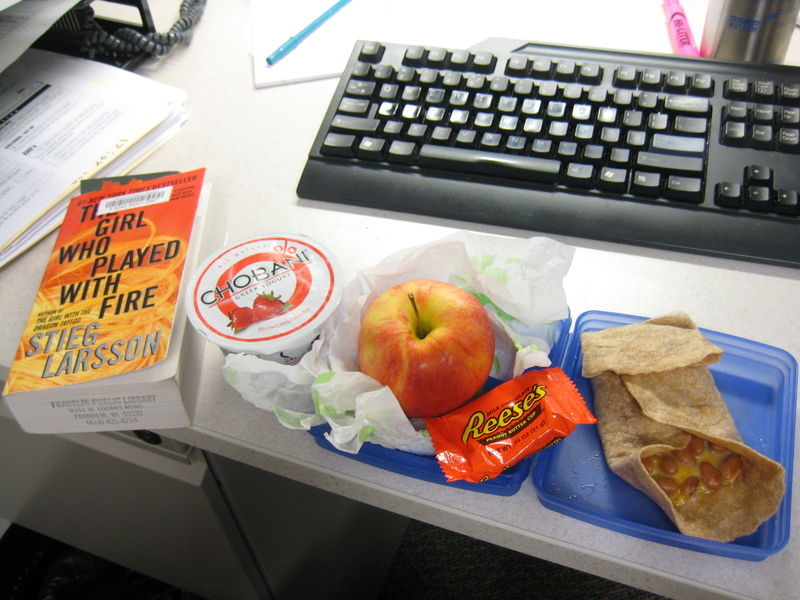 I also had an apple and a Strawberry Chobani yogurt. Oh yeah and a Reese’s PB cup, which I learned scores a 3 according to the Nuval system on Trading Up Downtown today. Oh well, good thing I only eat them during Halloween time! 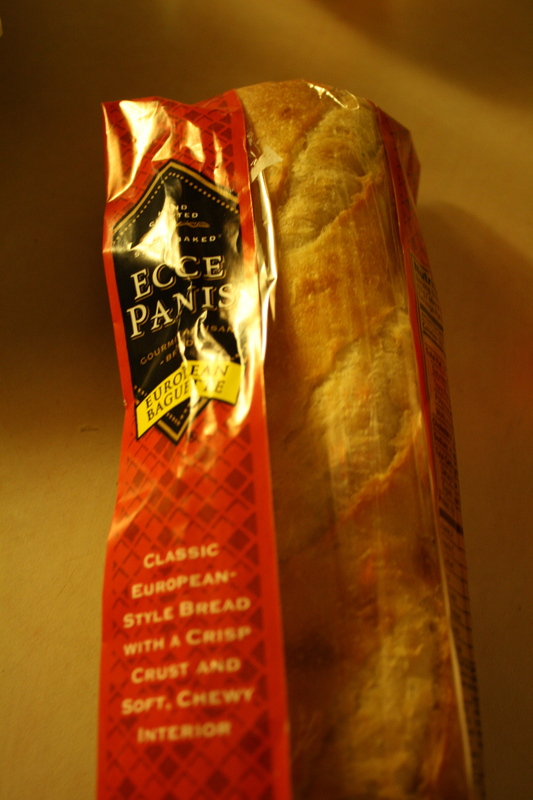 Mmm…European baguettes bring me back to eating in Europe. Love them! Before dinner, I relaxed, put my feet up on the couch and looked through my new Fitness magazine. Off to watch The Biggest Loser and rest some more. My legs aren’t as sore as they were yesterday, but I think I have a good night’s sleep and Burt’s Bees Muscle Mend to thank for that. Speaking of The Biggest Loser, I was reading this FitSugar article featuring Jillian Michael’s Fitness Ultimatums while blow drying my hair this morning. Thought you would enjoy!